If you live in San Francisco, you’ve likely stared out across the water and wondered what people are up to in the East Bay. Well, they’re building a craft beer empire. The tradition of brewing began soon after the introduction of grain farming, as our ambitious ancestors quickly came to recognize what we now know for certain—that beer is comfort, beer is community, and perhaps most importantly, beer is delicious. We’ve undoubtedly journeyed far from the original brew houses, with an increasingly intrepid collection of brewers and breweries, yet the original inspiration remains unscathed. With arms wide open, the East Bay has bars and beer gardens popping up all over, while local microbreweries are working hard to keep your glass from running dry. These 10 superb East Bay bars are serving up expert lists of hoppy IPAs and malty brown ales just waiting to make your acquaintance. The Hog’s Apothecary | 375 40th St.
With 33 rotating beers on tap, four wines and even one stag root beer, the Hog’s Apothecary holds strong to their belief in locally sourced brew, with the entirety of their gawk-worthy draft list coming straight out of California. Don’t be duped by the impressive beer selection—the bar’s restaurant brings some honest competition with a hearty menu of artisanal sausages and lard-fried chips that caters to even the grizzliest beer drinker. Head over to the port of Oakland, for a behind the scenes look at how this brewery’s small batch of lagers goes from grain to glass. After the tour, cozy up to the bar or lounge out on the patio to sample the final product. Keep watch for Linden Street’s latest project—a tasty, new beer garden & restaurant alongside of the Brewery. One of Oakland’s top chefs, James Syhaout of Commis and Hawker Fare will be designing the ultimate menu to pair with your favorite Linden Street lagers. Beer Revolution | 464 3rd St.
Halfway to 100, Beer Revolution comes in two taps shy of 50, with those bubbly brews always rotating and always artisanal. The staff knows just about everything there is to know about what’s in your mug, plus there’s a chalkboard that makes keeping up with madness a cinch. Doors open at noon, and the bar doubles as a bottle store, so drop in anytime to pick up your hard-to-find favorites. Beer Revolution holds weekly and monthly events, where you can meet the masterminds behind your choice ale or be the first to taste test new beer releases. The Trappist | 460 8th St.
Red brick walls, vintage décor, an ever-rotating selection of European style beer. . .we dare you to dream up a better taproom. The atmosphere is flawless, and the abundant list of hard to come by brews makes it the beer lover’s Eden. To top it off, there’s a menu full of creative entrées like “Green Eggs & Eggs,” plus charcuterie & cheese boards. Swing by on a Tuesday for rain or shine tacos on the patio. And since it’s just one BART stop away from Fox Theater, The Trappist is arguably the best place to start (or finish) a night out in Oakland. Pay a visit to their little brother, Trappist Provisions, (6309 College Ave.) and take your pick of over 160 bottled beers to sip on there or stash for later. 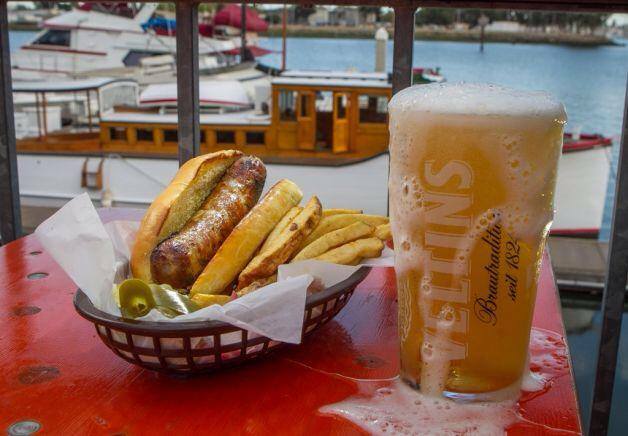 Brotzeit Lokal offers up brews with a view in its Oakland waterfront location. As the name hints, this is the place to go for all things German, with their homemade sauerkraut, pickles and mustards, bretzels, späetzle and all sorts of other tasty things you probably can’t pronounce. Brunch is served on the weekends until 3pm, and Brotzeit gives a whole new meaning to your average morning meal, thanks to their extensive list of handcrafted sausages. Triple Rock Brewery & Alehouse | 1920 Shattuck Ave.
An alehouse you can rely on, Triple Rock is one of America’s oldest brewpubs. Being in the business since 1985, Triple Rock offers timeless classics alongside a rotating selection of specialty and seasonal brews. The original brew brothers, John & Reid Martin, still operate the joint, expanding their expertise to places like Drake’s Brewing Co. in San Leandro and even Jupiter in Berkeley. The menu offers guilty pleasures like cheese fries, chili cheese fries and garlic fries, plus plenty of vegan and vegetarian options like Seitan Philly Cheesesteak and Chili to balance things out. Jupiter’s cozy outdoor patio, complete with dangling vines and a wood-burning fire pit, make this the perfect spot for an afterhours brew. Located just steps outside of the Downtown Berkeley BART, it couldn’t be easier to pop in for a sample of Jupiter’s galactic beer options. The Quasar or Jupiter XHP (Xtra Hopped Ale) will send you into orbit—pair them with an out of this world brick oven pizza for the complete experience. Eureka! Burger | 2068 Center St.
Another beer sanctuary near the Downtown Berkeley BART, with 30 craft beers on tap, Eureka! boasts one of Berkeley’s largest draft beer selections. Besides the brew, Eureka! has a full menu of gourmet burgers, like the towering Jalapeno Egg Burger, complete with bacon and a sunny side up egg, plus a travel-worthy ‘Hoppy Hour.’ Nightly specials include live music on Thursdays and a chance to steal-the-glass every Wednesday with the purchase of that week’s featured beer. The massive outdoor patio at the Freehouse has heaps of group seating and fire pits to give it that neighborhood joint feel, plus an extensive beer menu to boot. Four plush couches, a fireplace and a menu full of comfort foods like Chicken Pot Pie and Beef Stew disguises the Freehouse as your own living room.